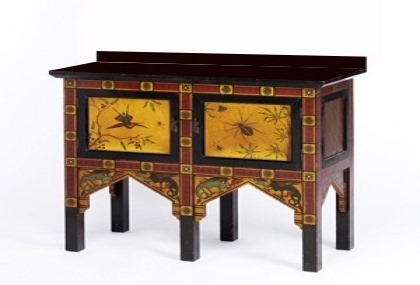 What a gorgeous sideboard this pieces makes. 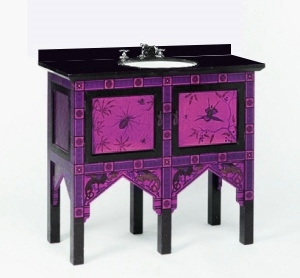 Bring High Victorian Gothic chic to your home. 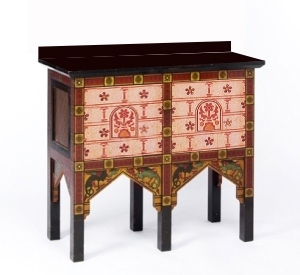 This sideboard is based on a cabinet by The Audsley Brothers, who published a book of Gothic designs & patterns in the 1880's. 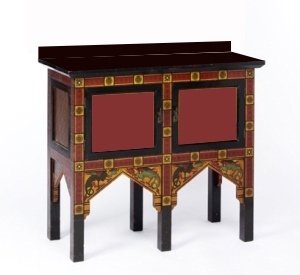 The decoration of this cabinet matches the style in their book. 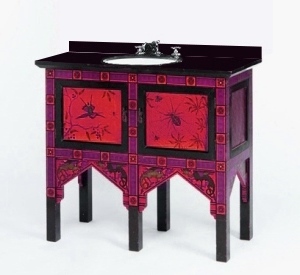 The piece is unmistakably Gothic Revival, both in shape & decoration. We have shown quite a few design options below you could go for. All it needs to complete the look is a large ornate mirror above. It fulfils Morris's tenet of beauty & use in everyday things. The sideboard is made to order, which means sizes & colours can be changed. As shown above you can have a narrower or wider version. 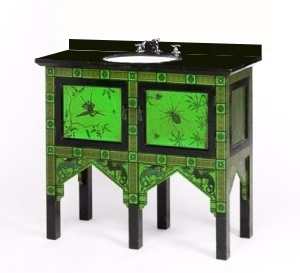 We have shown the washstand with a black polished stone worktop & matching small back upstand. But there are so many types of worktops you could have, from marble to granite, Corian, Quartz stone, wood, painted wood, etc., and each of these materials comes in a range of colours, from matt to gloss finish. Your choice. 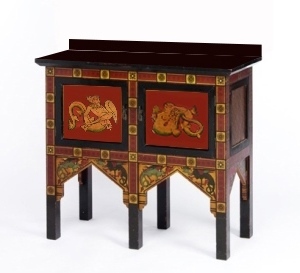 Hand painted panels on a gold ground, such as shown above, are always going to be the most expensive option for the washstand. And some people might think them too visually busy. The LH version above uses a plain painted panel, keeping it visually simpler. 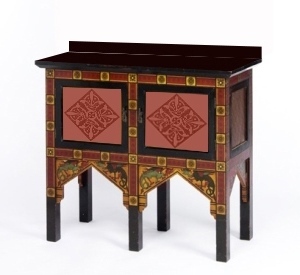 The RH version above shows a plain colour panel with Gothic design in darker colour. The diamond shape design echoes the shaped leg brackets. These are obviously going to be the least expensive versions to do. 2 more designs with more of a Burges flavour. The LH version uses a typical Burges 'stone bricks' pattern with a decorative centre. The RH version uses one of Burges's favourite motifs, the Mermaid, & matching Merman. 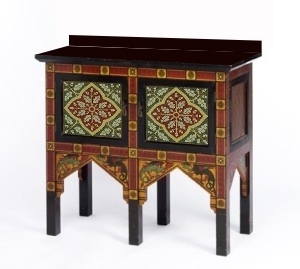 These 2 versions use abstract Geometric designs, typical of the Gothic Revival. The LH version uses a busier pattern typical of Burges. The RH one is a simpler stronger Gothic Revival design. Both suit the painted cabinet very well. The last version (for now!) shows the washstand using painted religious Icons for the door panels, on a gold ground. Probably the most expensive version to do.